The contrast in colors make this such a wonderful pic. Wish you would have written something for this photo. Glad you enjoyed it. Mum’s the word on Silent Sunday shots! Hope your day is a good one, also. That is just a beautiful bird. We don’t have cardinals here I don’t think…. That’s a shame. They are so pretty, especially in the winter, in the snow! I bet. I wish we did. Mostly I see blue jays around our neighborhood. Well, they are attractive, also! I like be it! He is so handsome! Gorgeous color! It must be cold where you are. The cardinal looks very chubby and well-insulated. Gorgeous bird! I remember them well from my childhood. They are one of my favourite birds, next to hummingbirds, them blue jays, so colourful and I choose those only because I have seen them. I see photos of incredible birds from around the world and I so love them! I do too. It’s amazing how many species of birds there are. I’m always so delighted when someone posts pictures. Love the composition of your photo. What a beautiful bird. Here in the UK I have never seen one. Yesterday was Rememberance Sunday a day to remember those who died in battle. We wear poppies, and have a moment of silence. A poppy looks a little bit like the face of your Cardinal so its quite a lovely coincidence that you’ve shared such a great photo. Yes, we wear poppies in remembrance, also. And you are right about the cardinal’s face. Thanks for your wonderful comment, Selina! I do too! They are so striking. Yes, they are real beauties! What a handsome bird! I wish we had them here. 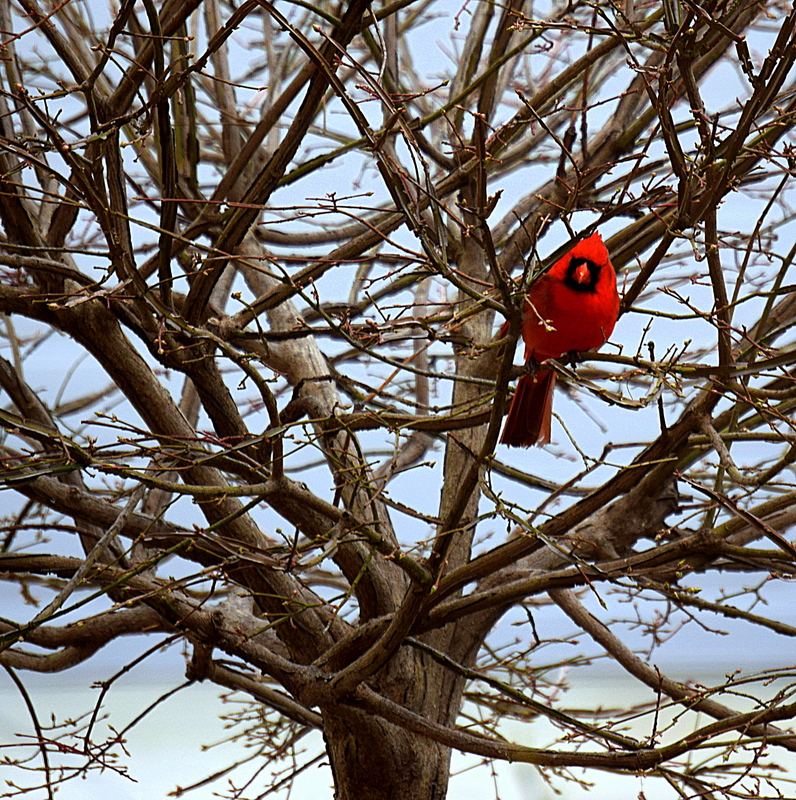 They are so enjoyable to watch, and Cardinals are in our area year round. They are such pretty birds…one of my favorites!